Fermob brings its functionality outdoors and focusses on an overall image for the garden, which goes far beyond common furniture - and is now turning to outdoor lighting in the shape of the Balad battery LED lamp by Tristan Lohner. The Balad LED lamp consists of a diffuser and a handle made of lacquered aluminium. 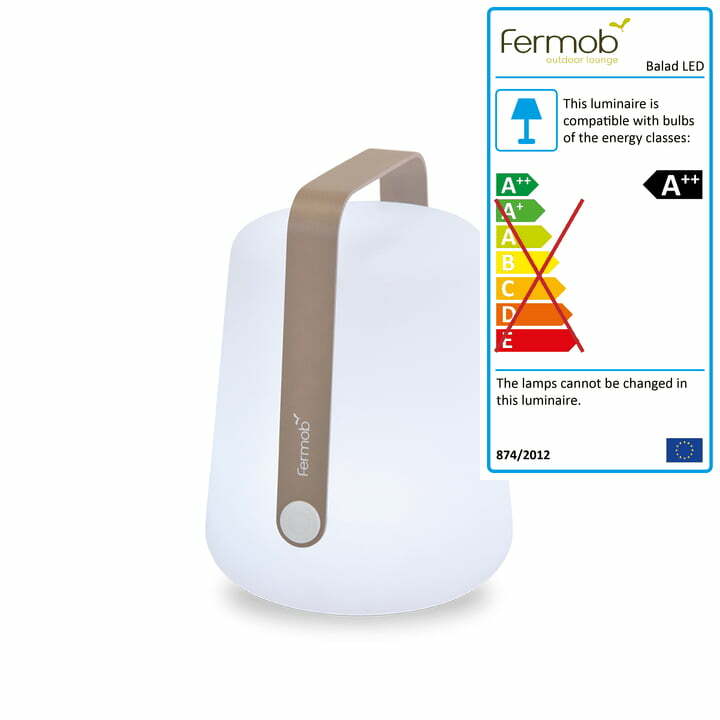 It is rechargeable and can be wirelessly set up anywhere in the garden, on the patio or balcony to provide light on a balmy summer night. Two brightness levels, regulated with the on/off button, create a suitable atmosphere. Thanks to the handle, the lamp is easy to transport and extremely flexible. Put it on the table, next to the entrance of the garden or turn the lamp into a pendant light by hanging up the handle using a rope on a branch or something similar. Alone or in a group, the Balad is a true eye-catcher and decorates your outdoor area at night. The Balad battery LED lamp consists of a diffuser in polyethylene and a handle made of painted aluminium in different colours. Two brightness levels (50% - 100%) are available for illumination. 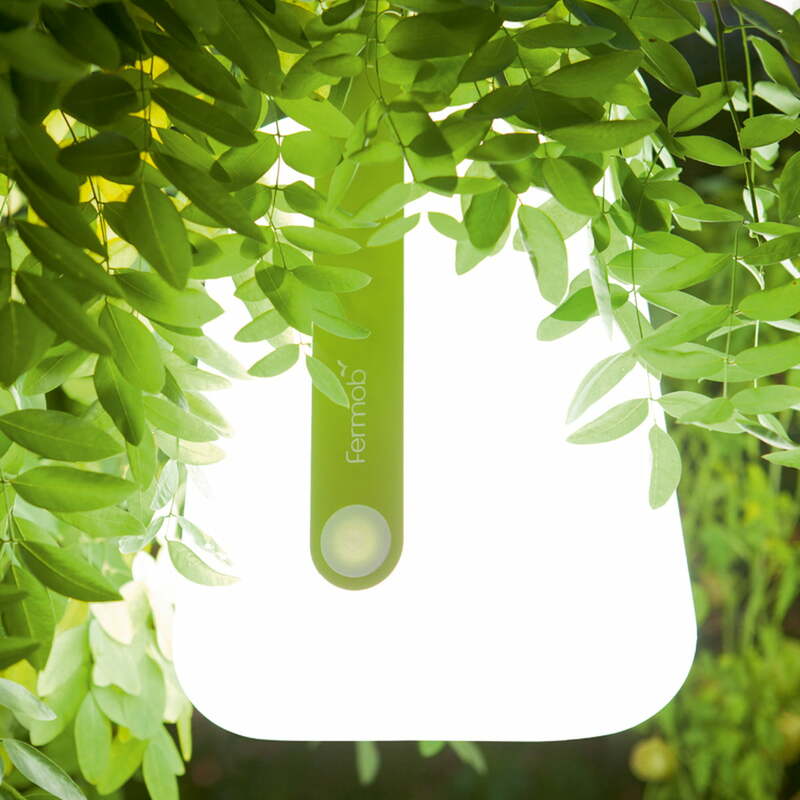 The LED bulb is rechargeable and works on battery operation. A 2-metre USB cable is included. Please note: the LED bulb cannot be swapped. The idea behind Balad is BYO light. In the desired size and colour, hanging or standing, for your home or for on the go during an evening trip to the beach. Balad is intended to be an object full of sensitivity that corresponds with the image of Fermob: simple, inspiring and free. Details 2 m USB cable is included in the delivery. 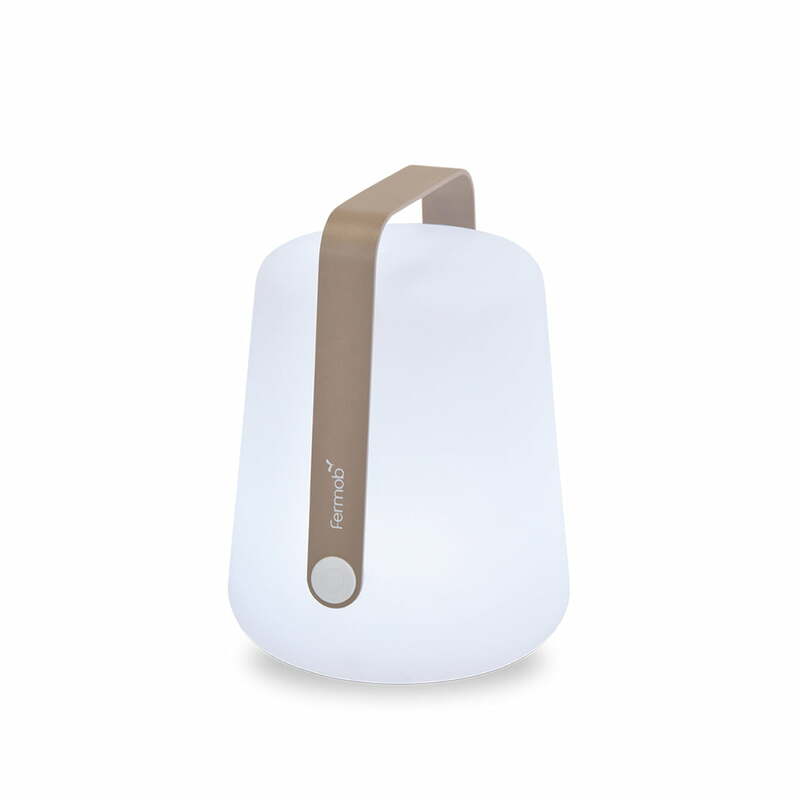 Single image of the Balad Battery LED Lamp by Tristan Lohner for Fermob in the colour nutmeg. The Balad LED Lamp consists of a diffuser and a handle made of lacquered aluminium. 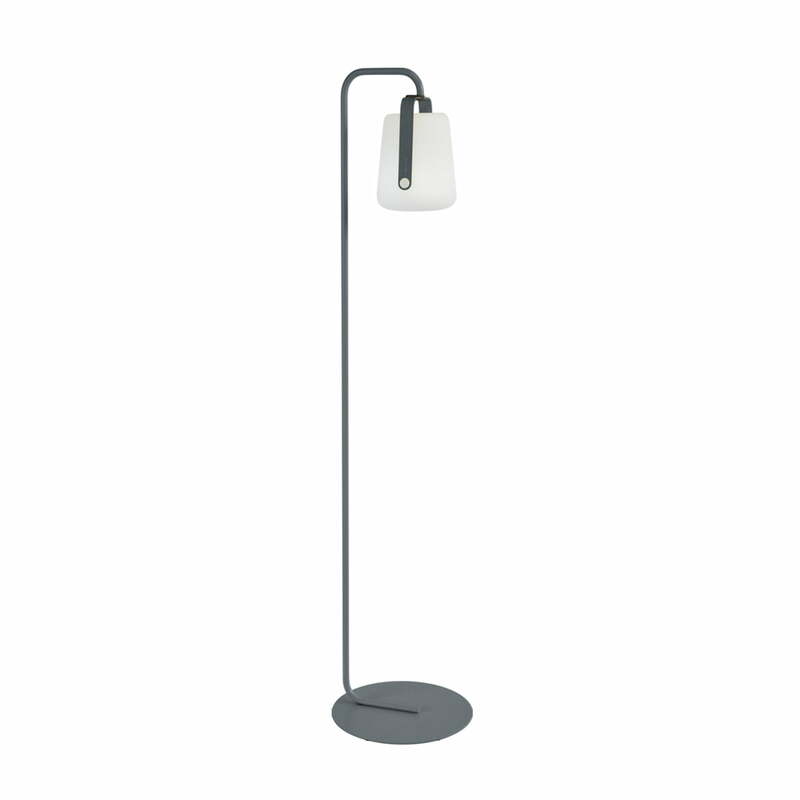 Isolated product image: The simple Balad base by Fermob in stormy grey is suited for the Balad lamp h 25 and h 38 cm, which can be easily attached by their handles. Thanks to the handle, the rechargeable Balad LED lamp is easy to carry and extremely flexible. Put it on the table, next to the entrance of the garden or turn the lamp into a pendant light. Balad Battery LED Lamp becomes a Hanging Highlight. Turn the lamp into a hanging light object by hanging the handle with the help of a rope on a branch or something similar. 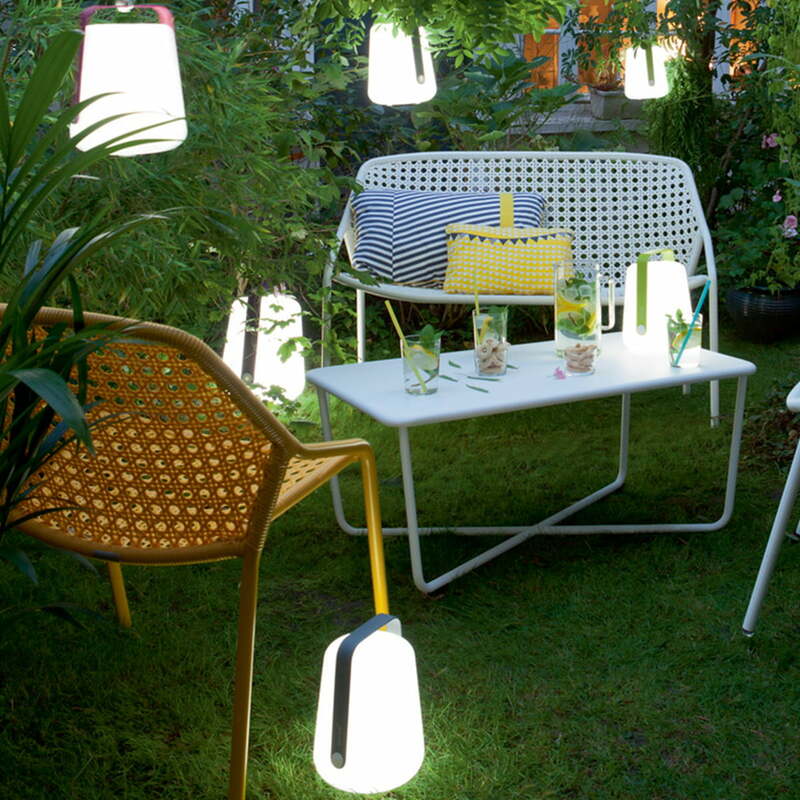 In a blink of an eye, the lamp is becoming the highlight in your garden. 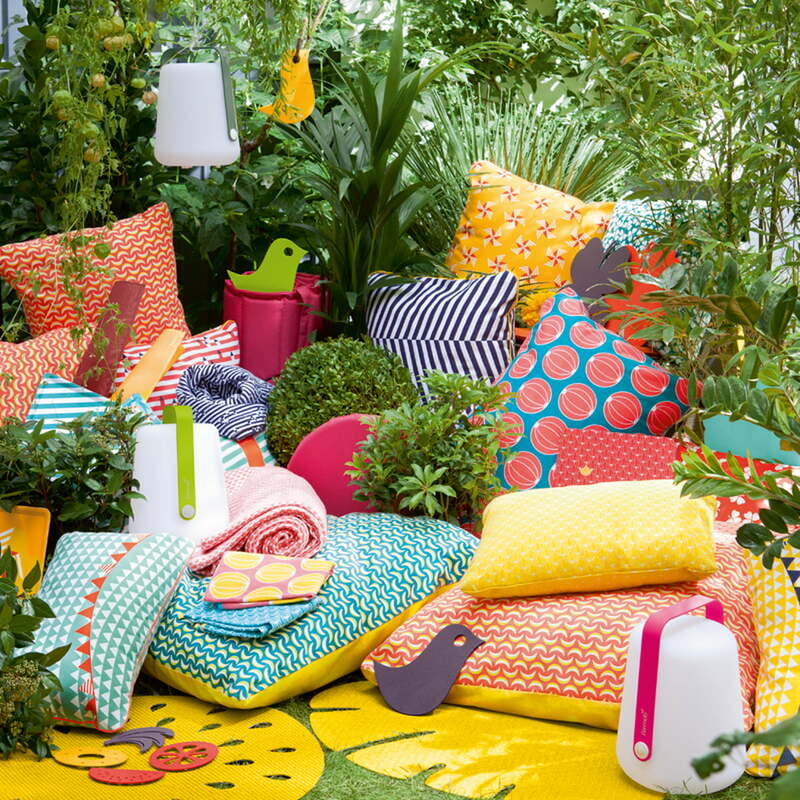 The Envie D'Ailleurs (french for 'wanderlust') collection by Fermob helps to bring the world's diversity of colours and exceptional patterns from all different kinds of countries to your home, with cushions, blankets, plates, coasters and rugs.